Leaving your dog outside by himself won't reinforce house-training. Forget what your neighbor or father told you about house-training a dog. Every major animal behavior organization, including the ASPCA, the Humane Society and the American Veterinary Society, agree that the most effective way to potty-train a dog is by reinforcing correct behavior, and limiting opportunities for bad behavior. Take your dog outside as often as possible. 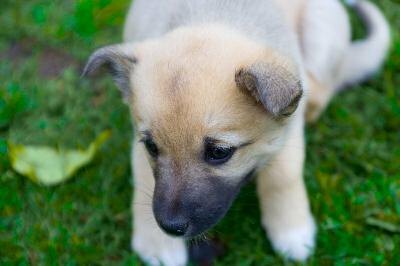 Young puppies physically can’t hold their bodily functions beyond an hour for each month of their age. In other words, the maximum amount of time an eight-week-old puppy can hold it is one to two hours. Repetition and rewards reinforce positive behavior. The more frequently you take your dog outside, the more opportunities he has to behave correctly and the more you’ll be able to reinforce this behavior. Every time he relieves himself outside, which could be several times during one walk, give him lots of verbal praise and a small treat. Restrict your dog’s access to the kitchen area. This lets you monitor his behavior, and correct accidents immediately. Block his access to the rest of the apartment with a baby gate, and slowly expand his access as he becomes house-trained. Confining him to surfaces with tile or linoleum floors also makes cleaning up accidents easier. Watch your dog closely for signals that he needs to relieve himself. Common behavioral signs include sniffing around, pacing and circling a particular area. When you see any of these signals, you must immediately carry him outside or place him on the puppy pad. Using a puppy pad is a great way to house-train your dog inside a high-rise apartment building, if getting outside takes several minutes. Put a disposable puppy pad, also known as a wee-wee pad, in a corner of the kitchen or laundry room. Being in an apartment means you can’t always take your dog outside immediately when you notice his warning signals. The top layer of the puppy pad is an absorbent material with a scent that attracts dogs. The bottom of the pad has a waterproof lining that makes cleaning easy and efficient. The pad must be the first thing your dog’s feet touch in the morning so that he gets used to relieving himself on the pad, and no place else. Clap your hands if you catch your dog relieving himself indoors, and immediately carry him outside or to the pee pad. Give him lots of praise and a treat when he finishes outside, even if he emptied half his bladder in your kitchen 30 seconds earlier. If you find an accident after it’s already occurred, you’re too late. Your dog will make no connection between his earlier behavior and your reaction several minutes or hours later. Clean it up, and make a conscious effort to watch him more closely. Place your dog inside a crate when you’re gone. Give him a small treat once he’s inside, and let him out as necessary based on his age. For a new puppy this means taking him outside every hour. Dogs dislike eliminating where they sleep, but will obviously do so if crated for too long. Remove your dog from the crate and immediately carry him outside or to the puppy pad. He’ll relieve himself immediately wherever you first set him down, so make sure it’s someplace you want him going. Clean up stains and accidents immediately with an enzymatic cleaner. Dogs prefer to “re-mark” the same spots, and only an enzymatic cleaner actually breaks down the attracting, odor-causing compounds found in urine. Until he’s completely house-trained inside your apartment, don’t trust him in the building corridor, stairway or elevator. Instead, carry him from your apartment door to the outside area. Although potty-training is frustrating, never push his face in the mess, scold or swat your dog when you catch him having an accident. Punishment fails to teach correct behavior, and will only make him to relieve himself behind furniture or under tables where you’re less likely to catch him.